Allow me to open a large can of worms. English spelling, as virtually everyone will admit, is absurdly complicated—and much more so than that of most other modern languages. While this situation may be good for editors and those who make dictionaries and spelling checkers, it’s bad for nearly everyone else. People learning English—whether as a first language or later in life—struggle to memorize innumerable exceptions to an already long list of spelling rules. But those of us who have known the language all our lives also struggle constantly to write it correctly, lest we embarrass ourselves or betray a lack of attention to detail. Why do we all endure such pain? It seems pointless. And so, as many language authorities have proposed over a period of more than 200 years, why not simply fix it? Why not simplify English spelling so that it looks the way it sounds, and make the entire problem go away? Spelling reform has occurred in other languages, with dramatic results in improved literacy rates and easier communication for everyone. Isn’t it about time we did the same thing for English? At first blush, this seems like a no-brainer, a long-overdue exercise—one that we might as well get out of the way now, because it will only be harder later on. And yet, beneath the surface of this noble idea lurk extraordinarily pesky issues. As annoyed as I get when I read misspelled words, and as sympathetic as I am to the plight of those trying to learn the language, I find myself torn over whether I could actually support an official reform of English spelling. Wutz Rong With This Pikcher? The problems with English spelling, of course, are obvious with a moment’s reflection. We have words with silent letters that serve no apparent purpose—such as the second l at the end of “pill” or the gh in the word “eight.” We have letters or groups of letters that are pronounced many different ways (or sometimes not at all). A good example is the letters ough, which are pronounced “oo” in “through,” “ou” in “bough,” “oh” in “though,” “uf” in “enough,” and so on. We have words with different meanings that are pronounced the same but spelled differently—think “there,” “their,” and “they’re,” for instance. And there are countless other examples. Such peculiarities in spelling, for the most part, serve no useful function, and simply add to the amount of work we all need to do in learning and using the language. A reformed, simplified spelling system would resolve all these annoyances and many others. Indeed, a certain amount of reform has happened all by itself over the years, as previously alternative spellings have worked their way into the dictionary as standard forms (albeit more so in American English than in some other varieties). Think of the word “catalog,” which was formerly spelled “catalogue,” or “draft,” formerly spelled “draught.” On a relatively small scale, sensible spellings do sometimes replace less sensible ones. However, this process has been hit-and-miss, with more misses than hits. The proposal, then, is that we systematically and definitively wipe out all the anomalous spellings in English so that anyone looking at a word in print will immediately know how to pronounce it—and, conversely, anyone attempting to write English will be able to get every single spelling right the first time. In other words, proponents of English spelling reform want us to adopt a (mostly) phonetic orthography, perhaps along the lines of what one finds in Spanish or Indonesian. Needless to say, though, it’s not quite that simple. The first question that arises is how far such a reform would go. For instance, we could make a good start by simply removing letters that are never pronounced. “Though” could become “tho,” “guard” could become “gard,” “foreign” could become “forin,” “doubt” could become “dout,” and so on. We could also, perhaps, reduce the number of ways to write any particular sound—so the “ee” sound in “street,” for example, might always be written “ee,” never “ea,” “ie,” “ei,” “i,” “e,” or whatever. Although these changes would help, however, they would solve only a subset of the problems—and the more extensive the changes are, the more difficult they would be for the public to accept. Consider the matter of words that are pronounced differently in different situations. You don’t even have to get into dialectal differences here—think of a word as common as “the.” If we’re spelling it phonetically, which vowel do we put on the end? Or do we have two separate spellings—one for when it’s pronounced “thuh” and another for when it’s pronounced “thee”? 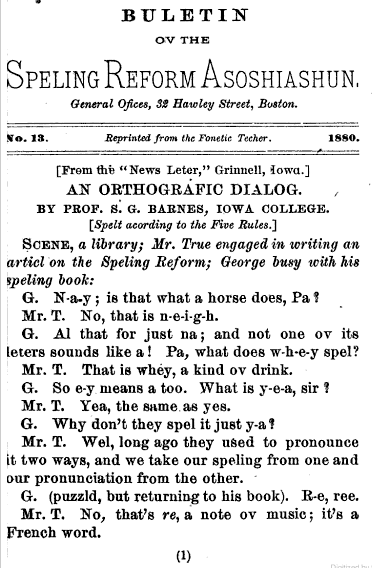 In such cases, some reformers propose adopting a neutral spelling that, while perhaps not perfectly phonetic, can adapt itself to either pronunciation. Other reformers say that this is exactly the kind of problem we’re trying to solve in the first place—but that takes us back to turning one word into two that have the same meaning. Then there are people (and I’d count myself among them) who point out that a word’s spelling gives important clues to its etymology, meaning, and relationship to other words. So even though the “a” in the word “real” is not pronounced, it serves the important function of showing the word’s connection to the word “reality,” in which the “a” is pronounced. Lose that letter, and the words no longer appear to have anything to do with each other. Thus, at least some of the peculiarities of English spelling exist for entirely legitimate, and still useful, historical reasons. Critics of this argument point out that English also has plenty of words whose spellings were entirely arbitrary—the word “receive” might just as easily have settled into the lexicon with an “ie” rather than an “ei,” and we can’t blame such oddities on the words’ derivations from other languages. Perhaps the most persuasive argument against spelling reform is that simplified spellings would be—at least initially—much harder for over one billion existing English readers to read, since we’ve already programmed our brains to work under the current, flawed system. There’s also that little matter of what to do with the billions of books, magazines, websites, and other documents that already use the “old” spelling. The task of retooling them in a new spelling system is unthinkably huge, but if they remain in their current state and are expected to be readable, most people will have to be able to understand how to read both systems—an even larger cognitive burden than what we already have. Supporters of spelling reform admit that the transition process is bound to be difficult, but claim that in a few hundred years, our descendants will thank us and the world will be a happier place. In the end, despite the ugliness and arbitrariness of English spelling, I feel as though I could get behind only a limited reform—one that addresses the most egregious and useless anomalies while leaving important etymological clues in place. But then, there’s no central authority for the English language, and it’s nearly impossible for me to imagine all the world’s English-speaking countries (or, honestly, even a single one) agreeing on a path to spelling reform. I think it wil haf tu remain a drém. Note: This is an updated version of an article that originally appeared on Interesting Thing of the Day on April 18, 2005.